Gerold Kukulenz was skilled in a classical way. He learned piano, guitar and bass and was playing in bands as young musician. He learned different styles of music and was already composing his first song with sixteen years. When he was twenty he started integrating electronic sounds in his compositions and began his musical experiments. 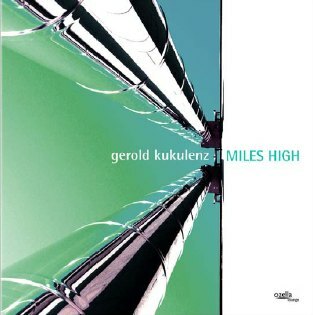 Miles High is Gerold Kukulenz debut album which he produced together with Dagobert (Dago) Böhm in 2005. Gerold is playing on this album keyboards, bass and guitar and also adds some flawless and eccentric electronical sounds. Gerold's impetus is to create life in electronical music, to tell stories without words, to develop soundscape without a vocal song. On The Nighttrain sounds like a mixture of Soul Ballet and Paul Hardcastle. The melody is doubtless hooking and awakes my interest for this album. Good sounds and arrangement. Gerold Kukulenz has a profound knowledge of synthesizers and electronical equipment and how to use it for an impressing effect. Miles High has nothing in common with Miles Davis although the word "miles" could suggest this explanation. The tune has a potential for an epic sound score but Gerold Kukulenz prefers in most of his tunes shortness. Soon the sound fades away before it gets some impact. Discovery is showcasing Gerold's guitar skills. He prefers the lyrical chords known by the New Age music. If you want to test the bass of your loudspeakers Under Water is certainly a challenge. The spacy guitar sound is perfectly wrapped up in Gerold's electronical environment. One can compare that music with the German groups Interface or Megabyte or Frank Fischer's "Skywalker". I look back in melancholy to Winfried Trenkler's "Schwingungen". Mellowdies could be played on a mellotron, or is it the synthesis of mellow and melody? Anyway it's slow and smooth. Space Walk is the right title for this melanche of guitar and electronic music anew underlayered with a deep bass. The rhythm is based on a very dry snare. Most of the tunes of this album can be count to lounge and electronical music. There is still something besides techno music. The combination of bongos and electronical music is best known by the formation "The Art of Noise". Gerold Kuklenz tries to bridge electronic and acoustic instruments with Spirits. This album is recorded for friends of lounge music. Jazz or contemporary jazz fans are prefering other music but that's a question of personal taste one cannot discuss about. Gerold Kukulenz key / b / g / electr.